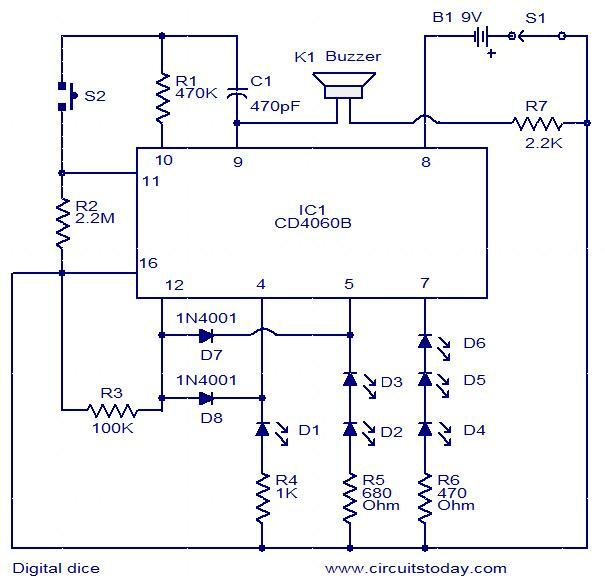 This is a simple and easy to construct digital dice circuit. The circuit is based on a single IC, CD4060B.The dice consists of six LEDs marked D1 to D6.The number of LEDs glowing indicates the numeral. The heart of this circuit is 14 stage binary ripple counter IC CD4060B.The IC also has a built-in oscillator. The oscillator output (here 2 KHz) is used to clock the binary ripple counter. The counter increments by one in its natural count sequence each time it is clocked. The oscillator in initially inhibited as long as the pushbutton switch S2 is not pressed. The counter outputs will be in logic zero state and all the six LEDs will be ON.As the push button S2 is pressed, oscillator is enabled and the counter starts counting. The counter outputs (pin 4, 5 & 7) changes from 000 to 101 and then resets to 000 to repeat the sequence. After 101 the counter does not advances to 110 because of R3, D7 & D8.When the counter just advances from 101 to 110 the diodes D7 & D8 become reverse biased and makes the reset pin (pin 12) high to reset the counter. The counter counts as long as the push button switch S2 is pressed. Also the micro buzzer will sound as long as the IC is counting. When the push button switch S2 is released, the counting is stopped and holds the existing state to represent the random number. Switch S2 can be a push button switch. Buzzer K1 is a piezo buzzer. Is dis a working circut? Could this be converted to use 12 volt bulbs via some sort of relay(s) instead of the LEDs? very nice, I have been trying to look for this. Thanks!